LAVERKIN – While visiting Washington County on Monday, Congressman Chris Stewart strapped on a tool belt, and he and members of his staff helped work on a home in LaVerkin that is being built by participants of the Mutual Self-Help Housing program. The Mutual Self-Help Housing program is funded by the U.S. Department of Agriculture’s Rural Development; USDA provides low-interest mortgages for families with low- to very low-income levels. Administrated in Washington County through the nonprofit Self-Help Homes, those who are approved for the program are required to supply 70 percent of the labor involved in building their homes, as well as help build the homes of others in the program. 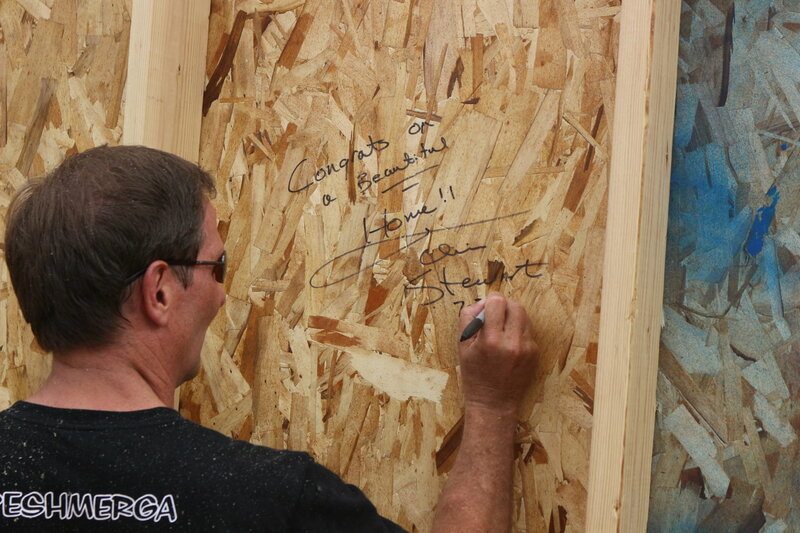 Also helping build the home was program participant Natalia Bosshardt. Along with her husband and a handful of others, they were also putting up plywood sheets and cutting out where windows and doorways will go. They aren’t working on their own home, however. Theirs is in Toquerville. 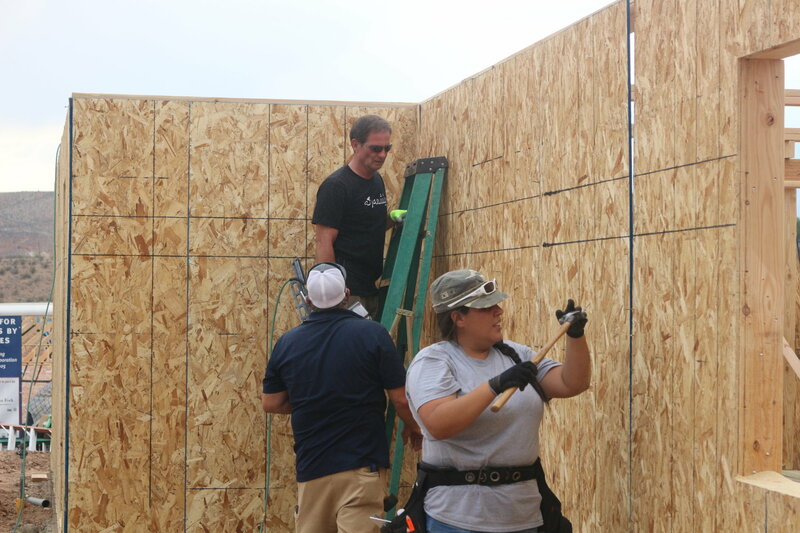 For the moment the Bosshardts are waiting on trusses to be delivered, so as with others in the program, when they’re not working on their own home, they’re working on the home of another participant. Usually the work is done after work or on the weekends. 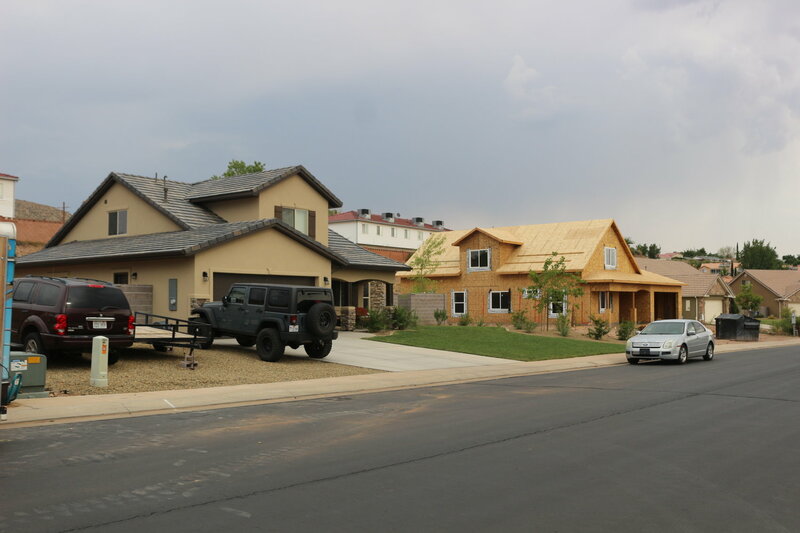 The Bosshardts’ home and the one they were building Monday are among seven homes being built in LaVerkin and Toquerville that broke ground in March. Building is anticipated to last for a period of 10 months from that time. With the exception of certain work that requires state-issued licenses, the program participants do the majority of the work on the homes, said Brad Bishop, Self-Help Homes’ executive director. No prior experience is necessary. "During that 10 months they do all the roofing, framing, cabinet installing, landscaping, painting, rock work – just about everything,” Bishop said. The sweat-equity the Bosshardts and others put into their homes helps keep the 33-year mortgages from the USDA low. Mortgage payments are also based on the family’s income, Bishop said. Self-Help Homes started in Utah County 18 years ago and oversees the USDA’s housing program in Beaver, Iron and Washington counties as well. During that time it has seen over 450 homes built and only experienced five foreclosures. When the work is complete and everyone gets to move in – no one moves in until all the homes are finished – Bosshardt said she’s going to take a week off work and enjoy her new home. It will be a nice change of pace from building after work and during weekends for the last 10 months. "I think everyone’s looking forward to having their weekends back,” Bosshardt said and laughed. She smiled at the prospect of settling into her new home in a few months. Self-Help Homes currently has a nine spots for homes in Toquerville that are set to begin construction in a few months, Bishop said.